You are here: Home / Pickleball Fun / My Pickleball Pet Peeve — Tossing Me a Ball that’s not Ours When our Ball Goes into Your Court! My Pickleball Pet Peeve — Tossing Me a Ball that’s not Ours When our Ball Goes into Your Court! Please indulge me momentarily as I get something off my chest. Many will likely roll their eyes – but the fact is, it bothers me. I mean it really bothers me. It’s one of my biggest pet peeves on the pickleball courts. My guess is it happens 30% of the time – it’s likely even more frequent than that. Prior to starting a pickleball rec game with your foursome, as a group you will likely spend considerable time meticulously inspecting and “negotiating” for the “best” pickleball available. You’re likely looking for a ball that has a little zip – but not too much as to render the dinks and short game ineffective. You will likely squeeze four or five balls – and pick the “perfect” one for the match – one that will satisfy the playing styles and preferences for all four players. And then, the unthinkable happens. You hit the ball into an adjacent court. However, instead of retrieving the ball that just came flying onto their court – that “perfect” ball that your foursome spent so much time testing and negotiating for – one of the well-intentioned players from this neighboring court tosses you the ball that they have been playing with. Egad! So now, both your court and this neighboring court are playing with different balls – balls that will come off the paddle differently, bounce differently and just feel differently. So what does one do? Here’s what I do — especially if we’re in the middle of a 9-9, knock-down-drag-out match: I toss the ball back to them and ask them for the original ball we were playing with. And I’m pretty sure my request generates eye-rolls! 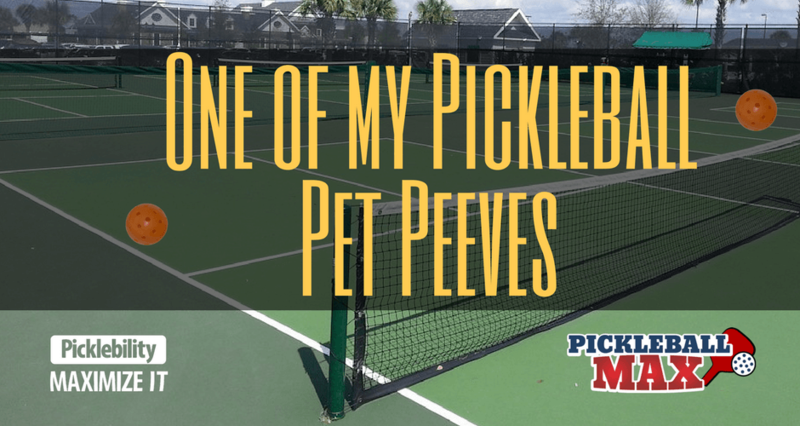 Who else feel my “pain?” Or perhaps you have a different pet peeve on the pickleball courts! Please let me know in the comments below. See you on the courts! We all write out initials on our balls so no question of whose ball it is. Hi Terry, that’s a good idea. However, even if it’s the same brand/colors of balls provided by the club, I still hate to change balls mid-game. I’ve got problems! Ha! My pet peeve is when people won’t pick up the pall and toss it to you and they just kick it or hit it on the ground with their paddle. It goes anywhere and you have to chase it. I love this article – it made me giggle- yes you’re right this happens all the time☺️not sure what the solution is except to put your name on the ball?—- I have even funnier stories of when your ball accidently goes on another court and the things people resort to doing🤣 Thanks for giggle Todd!!! Looking forward to hearing those stories, Sharon! Thanks for the comment! I pick it up quickly and act like it came from an unknown place and put it in my pocket and act like I’m going to play the next point. Then guys like Terry get excited, often shout, and get all bothered. My joke worked and I then return their ball. That is hilarious, Gregg. Thanks for the laugh! I agree with you in wanting to play the whole game with the same ball. I was made fun of when I asked for the ball back. Today I was told that I shouldn’t go on the other court to retrieve my own ball … even though their play was stopped in the neighboring court….. and I had yelled “ball”. Hi Eunice, I hate that that happened to you. Not everyone understands! Oh, well… keep playing! See you on the courts! I play at a senior center. A handful of players are awesome. (They play multiple places during the week.) Some of us are awesome at times …still figuring it all out. A few are slower. We have two Bob’s. Young Bob and old Bob. We ARE at a senior center…he is kind and well-liked. My pet peeve is the really good players hit the ball in places Bob could NEVER get to. Come on! I feel when he plays opposite me it is a good time to focus on placing the ball…yep…to his right lobed nice and slow. The game doesn’t go any longer and then he sits and rests a few games. Everyone takes turns playing with Bob. Just irritates me when the better players decide to practice their most challenging shots on Bob! Hi Lori, Thank you for sharing your pet peeve on the pickleball court. You are a very kind-hearted person. I agree with you 100%!!! THAT is the attitude all players should have Lori. Pickleball is just like society… a cross section of all types of personalities and attitudes. Yours is the one I prefer…..
I’ve never observed any players inspecting and testing for the “best” ball prior to playing. I agree your ball should be returned to you, hence, initial your balls. However, the emphasis on all the work that goes into ball selection is foreign to me. A pet peeve, that should be an adopted rule. Preventing players from holding a spare ball in their free hand while the game is in progress. Old time tennis players are accustomed to holding a spare ball in their free hand rather than using their pocket. Many pickleballs have a neon coloring. During fast volleys the sight of another neon pickleball in the free hand of an opponent with flailing arms is distracting to the players across the net. This would almost never happen in tournament play with a referee, but is very common in recreational play — even with advanced players. I’ve been told by opponents, “there’s no rule against it, so they see no reason to refrain” even when politely asked not to do it. Hi Leo, I can definitely see your point. Thank you so much for sharing and getting that off your chest! See you on the courts! being fairly new to this wonderful game, I had no idea that people are so meticulous about ball selection. I play at a Rec centre and we just use the balls provided. Guess I have a lot to learn! Hi Barb, Welcome to pickleball!!! What a great game!!! Perhaps I used just a bit of hyperbole to make my point. It’s unlikely that we inspect the balls to the degree I illustrated in the post. Not necessarily…Our group has 3 side by side courts with an errant hit crossing over pretty regularly. We play out of a bucket of club balls, all the same brand/model. We have all levels of players. We have never had a concern over getting the same ball back. Couldn’t agree more. Especially when they use crappy balls and I supply top of the line ones.